In 2004, just as the industry was heading into its last console transition, London, Ontario-based Digital Extremes went out on a limb with Dark Sector, a next-gen game based on its own original intellectual property. The game struggled upon release in 2008, and the studio resorted to doing work-for-hire gigs to keep the lights on. Now with another console transition on the way, the studio is ready to go out on a limb with its own IP once more, the free-to-play third-person cooperative shooter Warframe. Already in open beta on the PC, the game has also been confirmed as a PlayStation 4 launch title. GamesIndustry International spoke with Digital Extremes creative director Steve Sinclair (no relation) last week at E3 to discuss Waframe, the mid-size studio's gameplan, and the pressure to leave consoles for the increasingly popular mobile and tablet space. While Sinclair said the studio was confident about Warframe's success, he acknowledged that wasn't always the case. "I suppose internally over the last few years we've had a lot of the team ask why we aren't making a tablet game, or why aren't we making phone games," Sinclair said. "It seems like it's feast or famine there, and the team sizes are much smaller than ours. And we wanted to keep the people we had. If you want to get two or three guys and take a shot at mobile, it's probably awesome for you. But for a mid-size developer like us, it's even riskier than going free-to-play." Sinclair said that risk weighed on the studio. Warframe was an experiment, and Digital Extremes had no first-hand experience with monetization before. It was just as recently as March, when the open beta for the game launched on Steam and made the store's top 10 list, that the decision started to receive clear validation. Digital Extremes hadn't been planning on a console version of the game, but the buzz from the beta had caught Sony's interest. "Internally, the studio was sharply divided on what we were doing"
"They approached us, and they've been really, really good to us, helping us get more dev kits than they wanted to give us," Sinclair said. "They definitely squeezed themselves for us and the fact they put us up [in their E3 booths] three months after they sent us dev kits has been awesome for us. And it's given us a chance to expose the game to people that maybe weren't as interested in it when it was just PC free-to-play, because there's that certain stigma surrounding that." And it's not just the support of Sony that's made a difference. 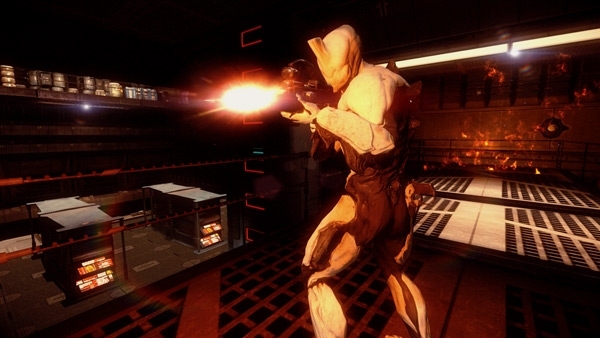 Sinclair said the company also learned a bit from its experience with Dark Sector and how much of the operation beyond the game itself was beyond Digital Extremes' control. "We're a piece in the puzzle when that's happening," Sinclair said. "The difference with Warframe is we hired customer support representatives. We hired marketing people. We hired people who speak different languages so our Russian players, and our Japanese players, and our German players can have people talking to them on our forums. We are taking responsibility for the game from top to bottom." Still, Sinclair said the studio had been waiting for the other shoe to drop for some time, and it was only weeks ago when they became convinced that hitching the company's fate to Warframe was the right call. Digital Extremes is hoping there's a large under-served market of customers who want to be space ninjas. "Internally, the studio was sharply divided on what we were doing," Sinclair said. "Because we had worked and tried to do frankly high budget looking stuff for way less money. You get a call from an executive saying he just saw that Halo trailer and why don't we have X,Y, and Z? And they don't take kindly to, 'Well, we're talking about budgets with extra zeroes to them.'" "Most of us are dead and gone, and the quadrupling down on a few franchises means that a mid-size developer like us that can't throw 500 people on a single project don't have any work"
The Warframe team began with 30 developers, but as it has gained momentum and other projects have wrapped up, Digital Extremes has been moving more of its 200-strong staff to work on the shooter. Even though with Warframe, Digital Extremes has a chance to thrive like never before in the company's history, Sinclair said he's keenly felt the pressures that have put so many mid-size developers out of business in recent years. "Massively harder," Sinclair said when asked if it's any easier for mid-size studios these days. "Ridiculously harder. Most of us are dead and gone, and the quadrupling down on a few franchises means that a mid-size developer like us that can't throw 500 people on a single project don't have any work. So this game has given us a new lease on life." But even if Warframe turns out to be a smash hit for the company, Sinclair said Digital Extremes would continue carving out its path as a mid-size developer. "I don't like huge huge teams," he explained. "It takes some of the fun and spontaneity out of the job. It gets mired in process and bureaucracy and people are able to distance themselves more from the projects. And the great thing about Warframe is to see individuals making massive differences to players and getting instant feedback from the community. That's still very gratifying to keep the team as small as possible." I agree that in general the traditional term of 'Mid-size studio' is definitely dying off - you don't have the capacity to provide the extreme high end, but aren't small enough to sustain any commercial/project set backs. Whats been happening in my experience is that they're becoming more like the film industry - utilizing insourcing, outsourcing and contractors to alter team sizes based on the requirements. You retain your smaller group of core staff to direct a project (especially the core game design team), and your studio expands and contracts coders/artists/LD's as per requirement for the project(s). In reality, this 'breathing' behavior doesn't apply to just 'mid-sized' Studios either. another question will these big AAA studios be able to go on once credit tightens, as its starting to do now, and the cost to borrow goes back to normal historical rates? very soon finding a 100 million to plunk down on a bet on your next big "thing" may not be so easy or even an option. As the Fed unwinds its unprecedented 4 trillion dollar position, strange days will be had for all. I think Digital Extremes is making the right move putting Warframe on PlayStation 4. It's the type of game most people wouldn't expect on a mainstream console, let alone it being free to play at or near the system's launch. They're likely to capture part of the PS4 zeitgeist. Plus, the content options on the PS4 at launch will be much slimmer than what's out there in the mobile/tablet space. That means Warframe will get notice and, most importantly, get played. Not everyone who tries it will like it, I'm sure, but almost everyone with a PS4 will probably try it. Hence, they'll win over some new players for life, such as it is. Studios should only be temporary setups to manage the production of individual games and franchises. Between production, the most it should be is a small skeleton crew, involved in creative, getting the next project set up (without the massive overhead of a huge crew to add pressure). The real focus should be on the people, not the studios. Also, if you're situated out in the sticks, like Digital Extremes is, you can't hope to crew down and crew up between projects. Its not a myth, people arent going to simply wait around for a "possible" job , they will jump at the first one they are offered, and the more talented the person the faster they will be scooped up. As for the analogy to hollywood, that also doesnt work since movies are shot in a matter of weeks, sometimes a few months, game creation especially AA plus games take years. You say we should focus on the people, Im not sure how having people being unemployed sitting on the sidelines is helping them. I myself was lost quickly to a significantly higher paid, permanent job and I know others who have been too over the years. We all know the score when it comes to temporary contracts but I think there is always an opportunity to reflect on whether or not this brings the best value to the company. From the evidence I've seen, there is a significant loss, especially when the super experienced get a call and say they're not coming back. Ultimately, its a choice though and the loss to the business or individual who participates in this type of employment has to factor in that loss. I just came here to say this game is amazing. I believe putting it on PS4 - especially if it hits at launch - will lead to some really staggering success. They deserve it.